Passengers aboard a dolphin watching tour with Encounter Kaikoura on the South Island of New Zealand experience a close encounter with these animals. A close encounter with a pair of Dusky Dolphins off the South Island of New Zealand, allows passengers aboard a dolphin watching tour with Encounter Kaikoura to capture some excellent pictures. As the dolphins gently swim near the boat, they show off their greyish/black colors running along their backs and it is not until these Dusky Dolphins leap out of the water, that one gets a good look at their white underside. The dorsal fins on the dolphins are two toned, with the one edge matching their backs and the opposite side being a light grey hue. From the dorsal fin to the tail, there are two streaks of white with a dark thorn shaped section running in the center of the streaks which is how people recognize their species. Dusky Dolphins are like any other types of dolphins or whales and love to frolic and play in the freedom of their natural environment. When boats are in the area, the Dusky Dolphins are usually willing to catch a ride along the bow or surf in the wake which makes these close encounters more frequent than other types of larger whales. Small groups of dolphins are often seen in the waters off Kaikoura, New Zealand and at other times large groups can be seen scattered across the surface of the water. There are anywhere from 12 to 20 thousand Dusky Dolphins which reside in the waters off New Zealand which move farther out into the deeper waters during winter to follow the source of food. 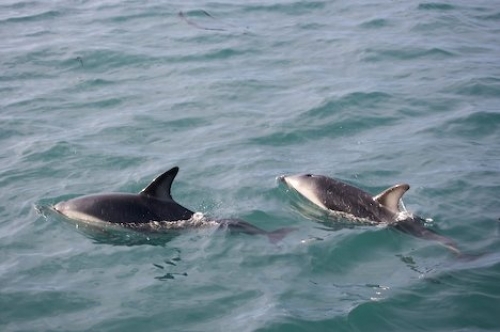 Encounter Kaikoura employs a very experienced crew on their dolphin watching tours who have been able to let visitors enjoy the pleasure of the Dusky Dolphins while teaching them about their behavior, characteristics and marine environment. On some tours, passengers are allowed to partake in a lifetime experience and join the Dusky Dolphins in the water for an extremely close encounter. These special tours should be booked well in advance as only a limited amount of people can swim with the dolphins at one time.